A serene village 7 miles to the east of Madurai lies Thirumohur. Kalameghaperumal and Mohanavalli thayar grace all the devotees with their nectairine glance. The kethakivimanam shines in the morning sunlight. Beside it is the sheerabdipushkarani- the theertha of this kshetra. Nammazhwar does the mangalashasana- “ Thondeer vammin”. He must have enjoyed the sugarcane groves and huge rice fields which he portrays as “ Karumbodu perunchennelvilaya” in this pasuram. It is indeed our greatest fortune that we are able to see this very same Lord who was extolled by the azhwars. The lore goes as follows: The Devas tormented by the asuras took refuge at the feet of Brahma, at satyaloka. “Oh Lord Brahma, we are unable to fulfill our responsibilities of protecting the world and its dharma. We had previously killed the asuras who prevented us from carrying out our dharmic duties. However Shukracharya has enlivened them through his mruthasanjeevani. Now we stay weakened and hapless. Lord Brahma at once replied “ Worry not. Water poured at the roots automatically reaches the leaves, flowers, branches and fruits of the tree. So does our ablutions to Lord Vishnu. 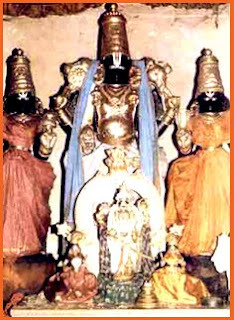 He will indeed bestow on us and the world prosperity and peace.” Thus pacificied and led by Brahma the devas then sought refuge under the feet of the omnipotent and omniscient Lord Vishnu- oru thani mudalvan- Nammazhwar calls Him.. The Lord is a lover and maker of infinite leelas. He suggested that the Devas better churn the milky ocean( ksheerabdi) with the Manthara mountain as the churner and the snake- Vasuki as the rope. Both the Devas and the asuras began the mammoth task of churning the ocean. Nev ertheless the mountain stuck at its base. The Lord took the form of a huge tortoise ( kurma) and gave His back to level the base. Through this incarnation He shows the world that this very body of ours exists to help all others around us in thought, word and deed. As they all churned and churned and churned out came the halahala poison filled all the quarters with its smoke. Everybody took to their heels, this time falling at the feet of Lord Siva. The latter consumed the poison unassumingly only reiterating the fact that if one has to help others one should do so even if he were to take poison. The Devas could turn powerful only if they were to partake of the amrutha (nectar), but Lord Siva was empowered even if he consumed poison. There lies His greatness and generosity. Lord Siva’s neck was coloured blue because of the poison which did not budge further than the neck portion. He came to be called Halasya sundaran, Neelakantan and so on. The churning continues and this time out come the kalpakatree, Kamadenu, Airavatha, Uchaisravas, Kousthubham, Apsaras etc. The Lord distributed them equally to the Devas and the asuras. The greatest of all the treasures is yet to come. And now it comes…no not the nectar but even better. On a thousand petalled lotus the mother of all the worlds incarnates to the awe of all the Devas. Straight she went to the Lord and garlanded Him. The Divine marriage was an extraordinary sight to see. The Lord gave her the best residence possible…His own heart. The churning goes on. Finally there is a mahapurusha standing with the amrutha pot in His Hand. He is none other than another avathar of the Lord- Danvanthri. The Devas began extolling Him while the asuras snatched away the pot from His hands and fled to Thirumohur, near Madurai. There they were caught in a huge fight as to who should give away the amrutha to all. Help the innocent and deceive the wicked is the ruling of the Lord. The cheated are to be blamed for their ignorance rather than the cheats for their malice. The Lord decided to hoodwink the cheats. Let this be a lesson to the world. He took the most gorgeous form of a lady ever possible and came to Thirumohur. The Asuras stunned at this striking beauty handed over to “Her” the pot almost instantaneously. As if dancing this astonishing lady imparted the amrutha to the devas and misled the asuras who were all the time watching her breathtaking beauty. An asura by name Swarbhanu gauged this trick and immediately sat along with the Devas. The Lord gave him amrutha, knowingly. However the two illuminary devas, Surya and Chandra confronted that he was an asura. The Lord smilingly hit him and he was now torn into two. As he had partaken the amrutha he did not lose his life. Both his parts were live. He came to be called Rahu and Kethu. From then on the planets became 9. Till then there were only 7 as the days are only seven in number. However Rahu and Kethu take the form of shadows and catch the sun and moon as eclipses. This kshetra is the place where the Lord took the form of mohini and imparted the Devas with the nectar. Whoever sees this Lord Kalameghaperumal will be bestowed with robust health, free from the miseries of old age and will remain young forever.